Last month, Futron’s Chief Executive Officer Shakil Qureshi led a restricted tutorial on Wire and Cable Knowledge during the October MILCOM 2017 event in Baltimore, Maryland. 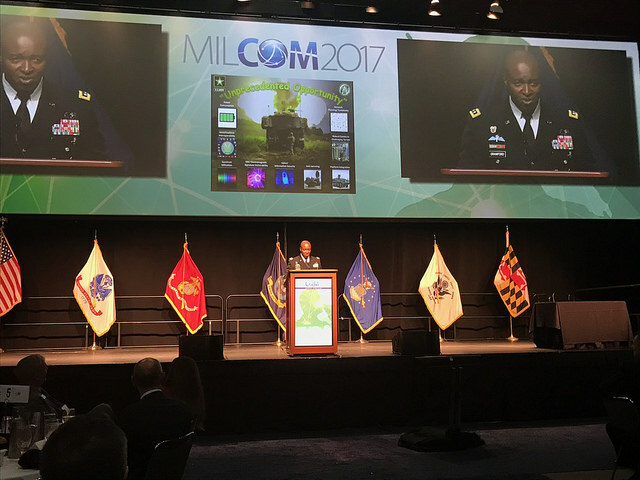 Held at Aberdeen Proving Grounds on October 23 – 25, 2017, MILCOM 2017 tackled subjects related to Military Communications and Innovation: Priorities for the Modern Warfight. Leaders, experts, and decision-makers gathered to exchange constraints and challenges facing their ability to equip today’s warfighters with the innovations more efficiently and effectively. 20 Lt. Gen. Bruce Crawford, USA, Army CIO/G-6, speaks at MILCOM 2017 about network modernization. Reprinted from SIGNAL Online, October 2017 with permission of Signal Magazine. Copyright 2017. All rights reserved. Our CEO’s panel drew Department of Defense (DoD) attendees interested in building their knowledge about cabling design features. Mr. Qureshi helped illuminate how cable designs, particularly their protective insulation, impacts performance, particularly in different installation environments. Attendees learned how to reduce the downtime of communications and weapon systems by better selecting cable types and following proper installation techniques. Communications systems today must meet two challenges, higher speed to create more bandwidth and provide security to guard against eavesdropping. Communications signal spend more time of cables than any other components of communications systems. The tutorial is designed to meet these two challenges. Mr. Qureshi served as the Chief Engineer for Belden Wire and Cable and holds numerous international patents for his cabling designs. He has provided guidance to industry through serving on the Electronic Industry Association (EIA)/Telecommunications Industry Association (TIA) fiber optic standards committee. Futron is proud to continue our service of the U.S. military and government. Given that 80% of system performance issues stem from cable-related issues, we appreciate the opportunity to enhance the expertise of today’s cabling professionals supporting Warfighters.